Minnie Mouse cakes birthday Cakes Long Island New York. Minnie Mouse cakes are this years favorite girls birthday party cake. The two cakes pictured here were created for separate customers but we decided to highlight them together due to the similarities in cake color and size. 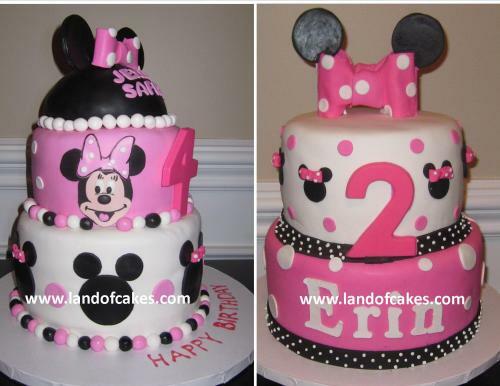 Both Minnie Mouse cakes are two tiered and decorated in pink and white fondant. The letters which represent the children's age is made of colored chocolate and is on a stick which makes it easy for the kids to eat. The cake fillings are quite different and both fillings are made from scratch in our Long Island New York bakery. The Minnie Mouse cake on the left is filled with a chocolate raspberry filling and was delivered to a repeat customer in Huntington, NY. As depicted in the picture above this cake also has multiple mini mouse face designs surrounding the cake which are made of edible fondant. On the right, the 2 year old's Disney birthday cake was made of vanilla cake with strawberry filling in each tier. The NYC family loved our Minnie Mouse cake creation and we hope to work with them in the future. Order your next Minnie Mouse cake from Land of Cakes New York.